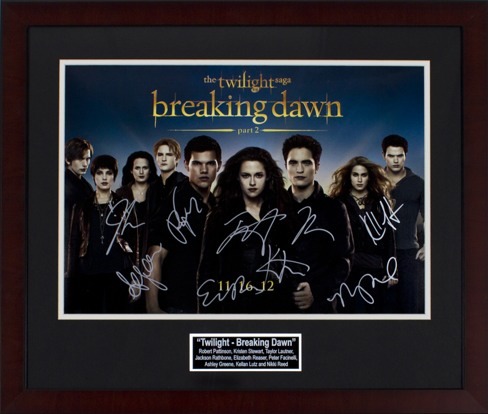 Charity Fundraising is pleased to announce that we just completed a signing with the cast of the brand new Twilight Breaking Dawn Part 2 movie! The Twilight franchise is one of the most popular movie series ever released and has set many records. The films are based on the books by Stephenie Meyer and have attracted a following worldwide. Charity Fundraising is proud to bring you this very limited cast signed 16×20 movie poster from this brand new movie scheduled to hit USA theaters on November 16, 2012. Silent auction items like this limited edition always do well for our charity partners as you have such a huge audience of book readers and movie followers to appeal to. Twilight New Moon set the record for advance ticket sales and set records for largest midnight release in history breaking record previously held by Star Wars Episode III and Harry Potter.This movie poster is signed by the main 9 cast members: Robert Pattinson, Kristen Stewart, Taylor Lautner, Jackson Rathbone, Elizabeth Reaser, Peter Facinelli, Ashley Greene, Kellan Lutz and Nikki Reed. The Twilight Saga Breaking Dawn Part 2 is expected to gross over $700 million at the box office. Do not let this rare fundraising opportunity pass you bye and reserve your autographed movie poster today. To view our current selection of autographed movie posters click here. To learn more about how you can reserve your autographed movie poster contact us today!